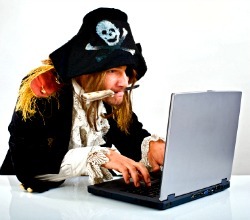 [Bits and Bytes: Website Tips], Beware of Cyber Pirates! Hey, Do You Know Your Website Copyright Protection Rights? It's Bits and Bytes here with a Riveting Tale of How to Battle Cyber Pirates! Since more meaningful information is obtained by combining bits into larger units such as a byte. . .", (Webopedia), we are extraordinarily pleased to offer you the incredible benefits of both, (Bits and Bytes, the most magnificent Cyber Sleuths of all time). Just in case you may have forgotten, I'm Bits and this here is my ever faithful companion Bytes. Yes indeed, it's your two favorite and overly exuberant furry virtual website building whiz kids who carefully sift through cyber space to gather golden nuggets of the best web site building tips to share with you. And boy oh boy, do we ever have a doosey for you today! We bet that you didn't know that there are hordes of Cyber Pirates lying in wait to rob you, did you? Unsuspecting website owners like yourself have fallen victim to these pirates who are lurking around every virtual corner of cyber space lying in wait to ravage your bank account. That's right, you read that right. . .
And not your normal, regular, every day pirates either. We know because our amazing (yet occasionally naive and somewhat ditzy) webmaster Sue just had a run in with a bunch of them. Our webmaster buddy Sue, just finished waging a very long and protracted battle with a group of corporate pirates from none other than the very reputable online company, Getty Images. You just can't begin to imagine the lengths that some highly regarded (yet from what we observed from our webmaster Sue's recent ordeal, downright despicable) internet companies will do. . . like the plundering tactics that companies like Getty Images has resorted to in order to loot the bank accounts of unsuspecting website owners. Bytes absolutely insisted that we give you a heads-up to this form of online predatory thievery so you can have your plan of attack all ready if anything like this should ever happen to you and I quite agree! You need to be forewarned and forearmed! You definitely, without a doubt (trust us on this one) need to know how you can successfully combat these virtual sneak attacks. , while we sincerely hope you never fall victim to such predatory tactics, you are now well armed to give a good kick-butting if you ever do! Until our next priceless tip. . .
P.S. If you have any questions or comments, feel free to. . .
We also discovered that it is very interesting and informative to follow the ebusiness gurus of all time: SBI's Tweets!